As far back as memory reaches there have always been pictures filling Linnea's brain and a crayon in her hand. Best known for her brightly colored and graphic style, Linnea is a painter and illustrator. Her work depicts characters ranging from clouds and birds in imaginary landscapes to Robots who want you to know what they're thinking. 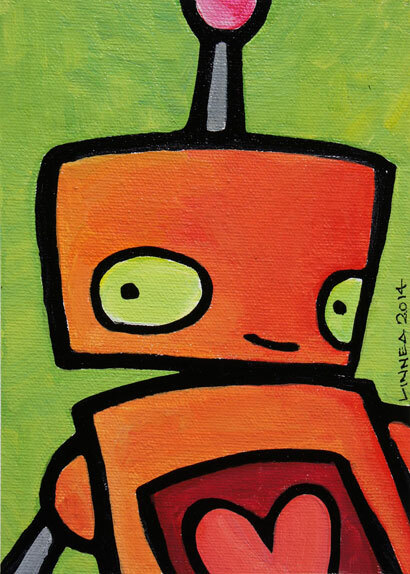 Linnea makes paintings available at open studio events, local galleries, and accepts work by commission. Love Drunk #11, acrylic & ink on canvas, 8x10"